Since time immemorial, this place has been the symbol of faith for the entire Uttarakhand region. Because of its spiritual magnetism, it has attracted many saintly men and numerous patriots who have always been ready to lay down everything for the sake of their revered motherland. The temple of Bagnath situated here is venerated by one and all. Devotees gather here on every Monday of the holy month of Shravan to worship the Lord, who is also known as the remover of sorrows. 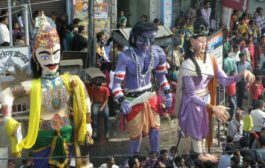 During the fairs of Uttarayani and Shivratri, it becomes very difficult to control the hoards of devotees who come to attend these fairs from far and near. The Nilaparvat, situated between the rivers Saryu and Gomti is inhabited by all the 33 crore Gods of the Hindu pantheon, the celestial being like Siddha, Gandharva, Vidyadhar, Urvashi etc. and manu sages. Irrigated by the Saryu, the Nilaparvat is held to be more important than the Vindhyachal. Those who desire to embrace death at place between Surya Kund and Agni Kund, become equivalent to the Gods by attaining salvation at the feet of Lord Shiva himself. Standing 1890 mts above the sea level, Kausani is nature's own reserve of solitudes and greenery. Even the father of the nation, Mahatma Gandhi has contemplated on the beauty of this region. Several snow capped peaks stand in a stately row, over 300 kms in length, shining against the azure sky making the horizon as seen from Kausani and enviable spectacle. The glory of the snow crowned Himalayan range reaches it's pinnacle when the sun rays turn them into crimson and gold. Mahatma Gandhi, who spent 12 days in 1929 at Kausani, penned his memorable commentary on the Geeta-Ana-Sakti yoga inspired by the scenic grandeur of this richly gifted spot. The guest house where the Mahatma stayed is now know as Anasakti Ashram. Hindi poet laureate Sumitra Nandan Pant was born at Kausani. Some of his early poems composed here have described nature in it's myriad manifestations. There is small museum to earmark that sacred spot. Kausani is ideal for those who seek to escape from the din and dust, hustle and bustle of big cities and wish to spend a quiet holiday in the lap of nature. Indeed, Kausani is a veritable heaven of beauty to which an excursion must be made on visiting Kumaon. The wide expanse of the famous Katyur Valley lies in front of it as you wake up to experience the Kausani sunrise. Lying in the Katyuri valley, 19 KMs away from Kausani and 26 kms from Bageshwar, is the small but ancient town of Baijnath. 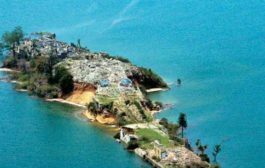 It was once upon a time the capital of the Katyuri dynasty of kings and the place was then called Kartikyapura. In Kumaun socio cultural region, Baijnath is one among remote antiquity and of historical importance. The remnants of those glorious days lies at the bank of the Gomti river in the form of a group of temples. The temple is famous for it's ancient and magnificent stone idol of the Hindu goddess Parvati. Around 8 KMs from Baijnath on the Gwaldam road is lies the famous Kotkimai temple. One can also visit Pandusthal which lies nearby. Tourist attractions in the Kanda region. Sunning views of the Himalayan peaks, an ideal location for bird spotting and animal watching in their natural environment. These include: Ghigaratola, Dhapoli, Dhallan, Chandrapur, Annapuran, Vijaypur, Kandamaidan and Kabashna. b) Kalika Mandir in the center of Kanda market. c) Gopeshwar Mahadev, 7km from Kanda market by road. a) Kalika Mandir-center of market. g) Pheninag Mandir- 15 km. a) Dushera fair at Kanda market, 10 days, 5 sacrifices. b) Shiva Ratri-Lord Shiva worship, Gopeshwar. c) Panchami fair Dholinag in September/October. d) Bashi Jagaran, 11days celebration, Golu and Ganganath temples. e) Dashahara-5 sacrifices of 9 night celebration in other temples. Tea gardens: The tea gardens Vijaypur and Saniudayar were established in the time of British rule. They are 5km from Kanda, and the tea is completely organic. Musk deer farm. 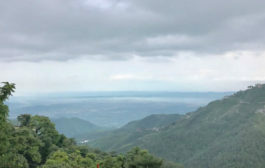 Situated along the route of Kotmania Dharamghar, 20km from Kanda organized by the Indian Government department of ayurvedic treatment for research. The experience of meditation and concentration. The calm and peaceful atmosphere and natural environment, of flowers and birds, and the views from the hills, create an opportunity for meditation and can enhance psychological peace and well-being. An opportunity for education. There are opportunities for national and international visitors to study various subjects relating to culture, architecture and organic farming, and all can experience and learn about fieldwork. Opportunity for cultural exchange. There are many chances for visitors to interact with the local community, and also to talk about their own culture, so there is a learning experience for everyone. a) Trekking, mountaineering, paragliding, golf. c) Bird watching and butterfly spotting. 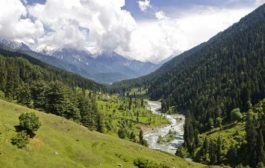 d) Enjoying the wonderful scenic views in the region, and seeing the Himalayan peaks in the distance. According to legends, Pandusthal was the battle ground where 'Kauravas' and 'Pandavas' had fought. There exists a natural ground half a km in breadth. The Himalaya is so near that one can get an excellent view of the ranges. To reach Pandusthal, a bus service is available from Garur to Jakheda. From Jakheda it is 20 km trek through the mountains. The district of Bageshwar is located in the northern parts of province of Uttaranchal in India. In east lies the district of Pithoragarh bordering Tibet and it's west lies the district of Chamoli and it's North lie the the Great Himalayas and in the South there is the district Bageshwar. The location of the township of Bageshwar, the headquarter of the district, viz a viz some important cities of India are as given below in road Kms. The functions and festivals of Kumaun are not only an expression of the religious social and the cultural urges of the people but have also sustained the folk culture and have been central to the economic activities of the people. 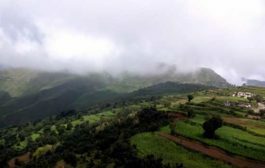 Also at remotely located places of hilly terrain, especially where communication is difficult and the land is cut up by mountain or water, the need is felt for periodical meetings at convenient centers, where exchange and sale of commodities may take place. Among the twice born citizens this festival is observed as the day of solstice. This solstice is called Mesh (ram in form) also; but the brahmins, Kshatriyas and Shilpkars observe a grand festival on this day with victuals fried in clarified butter, sweetmeats, betel-leaves etc. In many places fairs are also held. Pahari (hill dialet) songs are sung to accompaniment playing of Hurka (small drum like musical instrument) and people dance. This is an old festival of aboriginals of this place. On this day fishing is also done and small round cakes of ground pulse (baras) are also eaten. It has been the practice to smoulder the skin as many times as the number of 'baras' are eaten. But this practice has been considerably reduced now. (The smoldering of the stomach with a red hot iron is called 'tala dalna'). On this day fairs are held in Dwarahat, Syalde, Chaugar and Lohakhai. Women fast on this day. The story of chaste Savitri and Satyavan is heard on this day. The figures of the dead Satyavan, Yamraj (the God of death) and eminent jewel among chaste women Savitri are drwan under a banyan tree and they are worshipped Consecrating the thread of twelve knots (door), women tie it around their necks. Hariyala or the solstice of Karka, 10-11 days before the solstice of Shravan (July-August), putting soil in bamboo pots etc. preparing a bed, paddy, maize, horse bean and other grains produced in the rainy season are sown and this is called Hariyala. It is not put in the Sun. By doing so the colour of the plants becomes yellow. This is a famous fast. The women hold the rule of Chatursmasya (the bathing and fasting for months beginning on the eve of the rainy season) from this day. The fast ends on Haribodhini (awakening of gods). The solstice of Simha is also called olagia. Earlier, during the Chand rule, craftsman received reward on this day by showing or exhibiting articles of their crafts and handiwork, and the other people too carried flowers, fruits, vegetables. Curd, milk, sweets and several kinds of best things to the royal court or as present for the venerable people. This was known as the rite of 'olag'. This custom resembled the presentation of gifts to the britishers on Christmas day. Even now this festival is celebrated in some majors. So this solistice is called 'olagia' also. This is called ''Ghrit' or 'Ghee' (clarified butter) Sankranti. On this day there is a wide-spread custom to consume much Ghee with breads prepared from pounded horse-bean. This fast is kept on the third day of the dark half of Aug-Sep. The women folk observe this fast for prosperity, that is the longevity of their husbands. The Samvedis have their 'Upakarma' in the Hast asterism. This fast is held on the eighth of the bright half of Aug-Sep. making Doorva (agrootislinearis) of gold, silver, silk etc., consecrating and worshipping it, the women wear it themselves. Prayer to Doorva Devi is made for gaining prosperity and progency. Food cooked in fire is prohibited on this day. Beginning from the eighth day of the bright half of Aug-Sep to the eighth day of the dark half of Sep-Oct, many devotees do the worship of Laxmi and observe fast. The worship of Nanda Devi had been continuing in the court of the Chanda kings traditionally with great pump and show. This is one among the tribal festival of Kumaun. Nanda is the Ranchandi (Chandi of battle) of Kumaun. The elementary battle incantation here is 'Jay to Nanda Devi' , 'victory to her'. The sacrifice of the buffaloes and goats is made in her worship. 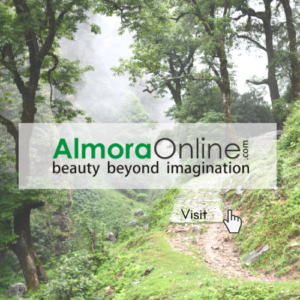 The worship in Almora is even now made with great splendour and huge fair is held. The descendants of Chands do this worship. In Nainital late Lala Moti Ram had invited this fair. Fairs are held in Katyur, Ranikhet and Bhowali also. She is reported to be family deity of the kings of Kumaun. Minor Diwali is observed on the full moon day of Sep - Oct. The women keep fast. The worship of Laxmi is made in the night. Diwali lamps are lit. The oblation of 'Pakwan' (pudding) and sweetmeats is made and then taken by people themselves. The beginning of vice of gambling too starts from this day. One of the largest fair of Kumaun region, the Uttraini festival of Bageshwar, is organized in the month of January for a period of one week and is frequented by Almora traders, on barter or money lending intent, and by the Bhotiyas from the snows, as well as by a great multitude of people from the surrounding villages. The chief articles of merchandise are : ponies, goats, sheep, furs, yak tails, musk pods, borax, salt horns, books, shoes, fruit dried and fresh. The Bhotiyas bring down excellent ponies, which breed in a wild or semi-wild state over the Tibetan border.